Wow! What a reaction! We have been totally taken aback by the reaction to our latest product, the PlayAUDIO12. From regular gigging musicians (we love you guys) through to high-end touring professionals, and seasoned music tech journalists, the reaction to the PlayAUDIO12 has been astonishing. We thought it would be a good idea to answer some of the most common questions we've received about the PlayAUDIO12 and put them all in one place. Of course, if there's a question we haven't answered here, just comment below and we'll be happy to help. We've had a huge response for the PlayAUDIO12; our first production run is almost totally allocated and sold out already, before they've even hit the stores! That said, if you want a PlayAUDIO 12, they're available for pre-order NOW and should be hitting the stores towards the end of October 2107. We strongly recommend calling your dealer up straight away and ordering one to make sure you get it! How many audio outputs are there? What's the quality like? PlayAUDIO12 features 12 audio outputs in total: ten of those are on balanced 1/4" TRS connections designed to send to the house PA system. The other two feed the onboard headphone amplifier, which is specially beefed up for live use. The audio quality is superb; we use high-quality 24bit 96kHz D/A converters with matching, low noise, high output driver circuitry protected from phantom power. We've already had some high profile endorsees line up to use the PlayAUDIO12 as their main playback system. Failover switching is cool! But how quickly does it switch over? Will I hear it? One of the great features of the PlayAUDIO12 is its ability to connect to two synchronised computers to form a live failover/redundancy setup. If one computer goes down, PlayAUDIO12 switches over audio and MIDI to the other machine in an instant. We really do mean in an instant too - in our blind tests no-one could tell when the changeover had happened, it's that fast! It's not just audio that changes over quickly, either; our MIDI changeover is even more impressive, thanks to the quirks of the MIDI protocol. In practice, you may notice that a sustained pad sound may disappear until the next note is played, but 99% of the time you won't notice any changeover has happened. Can I split the outputs between two computers? The original inspiration for the PlayAUDIO12 came from our highly successful range of iConnectAUDIO interfaces, which allow two computers to be connected simultaneously. 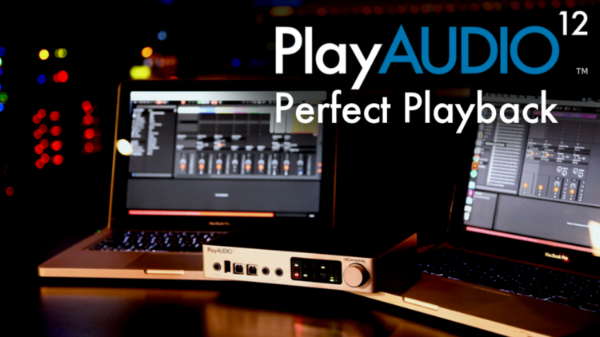 PlayAUDIO12 allows you similar levels of connectivity, whilst allowing you to share the PlayAUDIO12's outputs between two machines. Use PlayAUDIO12 as a stand-alone, multichannel audio/MIDI interface, as a shared interface between two computers, or as a full-blown live failover system. The choice is yours! Can I chain multiple units? Using a 1/4" patch lead from the Control Out socket and plugged into the Control In of another PlayAUDIO12 means that the two units switch together in the event of a failure. This allows multiple PlauAUDIO12 interfaces to be "stacked" creating a hugely powerful live failover solution. PlayAUDIO12 is also a very powerful MIDI interface, which offers up to twelve MIDI ports. Due to space restrictions, however, these aren't traditional DIN MIDI ports, but something rather more clever. USB-MIDI is becoming ever more popular, and out PlayAUDIO12 features our patented USB-MIDI Host port for connecting up to 8 USB MIDI devices via USB. This can be achieved very cheaply and easily simply by plugging in a standard USB hub to the USB host port. Should you need DIN MIDI outputs, simply connect any USB Class Compliant MIDI interface (such as our mio10 or MIDI4+ interfaces) to the USB-MIDI host port, or to a connected USB hub. We're also very proud to offer MIDI via Ethernet, which is able to provide four separate ports of MIDI over a single Ethernet connection, which can in turn be connected to another Ethernet MIDI interface (pro users have had great results with our MIDI4+). This is a great solution for running MIDI over long distances on stage using either a regular Ethernet cable, or even a connected wireless hub; Ethernet MIDI is an exciting new option.